Cause of Death: Impaled through the chest with a lighting beam. 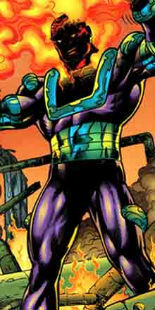 NOTE: Major Disaster created by Erik Larsen, with help from Keith Giffen and Victor Bridges. Major Disaster was a powerful eco-terrorist that would target power plants due to them endangering the environment. It was on one such assault that he encountered the bounty hunters of Freak Force. They eventually managed to defeat the villain, sending him to prison where he was selected for enslavement within the M.M.M.S. The M.M.M.S. was dismantled by Freak Force, Chelsea Nirvana and her Henchmen, liberating all of the super-powered prisoners. These former inmates would join up with Chelsea as an army that attempted to conquer the Vicious Circle. CyberFace defeated Chelsea and folded her forces into his own. Major Disaster and Weed later attack the Jerry Rivers show, but are confronted by Max Damage. Major Disaster is accidentally killed when a light beam sails into his chest.